The Manuals have been created to help both those I teach directly, and those who require a self-study course, to communicate as they would wish. Designed very much with the learner in mind, and written in an easy, direct and straightforward style, these books are supported by the filmed, recorded and illustrated materials on the Bliss Voicebox learning website. The Bliss Voicebox is available to learners with a client login. This secure site is regularly updated and improved to provide the best possible learning experience. Each manual comes with its own login to the Bliss Voicebox that is live for 18 months from dispatch date – probably 3x longer than you’ll need - but if you want an extension after a year and a half, we’ll be happy to oblige. 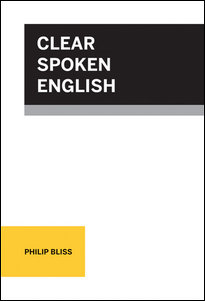 The CLEAR SPOKEN ENGLISH manual will help the learner, especially the non-native speaker of English, enhance pronunciation skills, whilst also optimising vocal abilities - so that English feels more natural. For native speakers, it provides a clear users guide to pronunciation, phonetics and good vocal practice. THE REMEDIES: PROFESSIONAL COMMUNICATION SKILLS manual will help the learner communicate with confidence at all levels and in all situations. Taken as a journey from the speaker’s brain to the listener’s ear, this manual reveals how spoken communication works, why it sometimes doesn’t, and when it doesn’t, how to fix it. This book is currently in development and will be available soon.